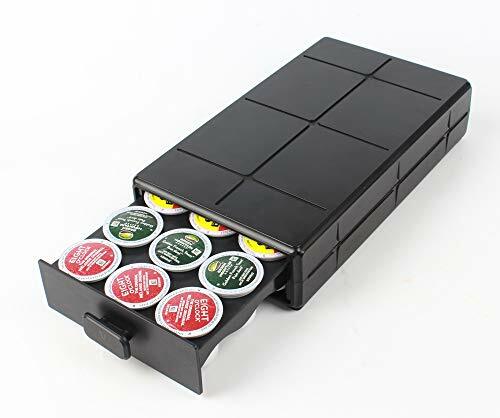 EVERIE Coffee Pod Holder Drawer for K-Cup, 18 Pods, Black by V EVERIE at Rat Coffee Shop. MPN: KP1801-BLACK. Hurry! Limited time offer. Offer valid only while supplies last. Patent pending drawer for 18 K-Cup pods. Drawer is with 3 lines, each line is for 6 pods. Easy to take every pod, the end pod holes in each line is for 2 pods, very easy to put it or take out. Smooth slide in or out. Strong frame does not bend over with coffee maker on top so no conflicts traps the slide. 40 Lbs affordable weight on top while K575 with water fully filled is about 18 LBS. Solid frame supports the coffee maker and pods in perfect position. If you have any questions about this product by V EVERIE, contact us by completing and submitting the form below. If you are looking for a specif part number, please include it with your message.